For Kurt Busch, there's no better place to snap a long winless streak than Bristol Motor Speedway. 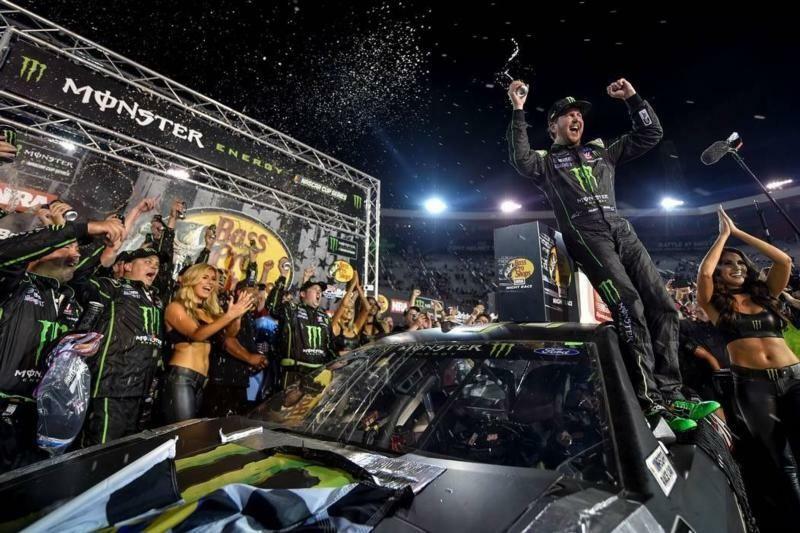 At the track where he earned his first career victory, Busch stormed to the lead on a late restart and held on to win the Bass Pro Shops NRA Night Race on Saturday under the lights at The Last Great Colosseum. Busch got his first win here in 2002, and he has six career wins at the .533-mile high-banked short track. His last victory in the Monster Energy NASCAR Cup Series came at Daytona last July, a streak of 58 races. "This track brings out the best in everybody," Busch said. "Just to come here and feel that Saturday night atmosphere and racing under the lights, it brings you back to your roots. To have Billy Scott (get) his first win - he's a short-track racer who grew up going to all the different tracks. When you come to the holy grail of short tracks, you want to win it." The race marked the 30th career victory for Busch, and he joined brother Kyle as the only two brothers in NASCAR history with that many wins. Thirty, it seems, was an important number for Kurt Busch. "I always wanted to get to 30," Busch said. "This is a big win for me. I grew up at Roush Racing with a guy named Mark Martin. He helped me, he was a great mentor and I looked up to him as a racer. He ended up with 40. I said before I won my first race, 'If I can get to 30, that's a pretty special career.' Made it tonight. I'm choked up about it. I really love this win tonight, and to have six Bristol trophies is special." Under a lap-471 caution, Busch was one of several drivers to stay on the track while others pitted for tires. He restarted second to Clint Bowyer but got a better restart and took the lead on lap 477. "It was up to Bowyer to choose the lane," Busch said. "He chose the outside and we got a perfect start on the inside. I dug it perfect right into Turns 1 and 2, and the spotter (Tony Raines) said, 'Take it, take it,' which meant go to the wall on exit. I didn't even bother to look in the mirror." Kyle Larson pitted for tires under the yellow when Busch stayed out and came back to finish second. Chase Elliott was third, with Joey Logano fourth and Erik Jones fifth. Sixth through 10th were Bowyer, Ryan Blaney, Alex Bowman, Jimmie Johnson and Kevin Harvick. Harvick battled back from losing two laps to post that top-10 finish. Busch's younger brother Kyle had an eventful night. The seven-time Bristol winner spun on the third lap and fell two laps down while his team tried to repair the damage. He got back on the lead lap and charged into third place with 86 laps to go. But while trying to pass Martin Truex Jr. for second on lap 431, he clipped the rear of Truex's car and send the No. 78 spinning into the inside wall. An angry Truex later kicked the side of his car as it sat on pit road. Busch was able to continue, but fell back to 11th under that caution because damage to the car caused his team to take longer than usual to fuel it. With 20 laps to go, Busch slowed and spun with a flat left-rear tire, caused my damage while trying to fight back to the front. He finished 20th. The first stage was marred by a 15-car crash on lap 3, triggered when Kyle Busch got sideways underneath Blaney and spun off Turn 4. That caused a backup when cars tried to dodge the No. 18 Toyota of Busch, but numerous cars piled in or spun to try to avoid the melee. Busch lost two laps as his Joe Gibbs Racing team made repairs, but he did climb from 33rd to 27th by the end of the first stage. Larson and Harvick traded the lead before Blaney took command, leading twice for 108 of the first 125 laps. Harvick closed in in the latter stages and dove underneath Blaney on the final lap while the two raced for the lead in traffic. Blaney took the stage win by .003 seconds as he and Harvick worked around David Ragan at the checkered flag. Bowyer was third, with Elliott fourth and Aric Almirola fifth. There were two dramatic finishes to end Stage 2. The first was the race for the lead, when Elliott fought underneath Logano off Turn 4, but Logano was able to nip him at the line. The second was the battle for 20th, as the first two cars one lap down fought to get in position to get the free pass. Busch's damaged race car darted through traffic and beat Harvick to the checkers. Harvick had lost two laps when he had to pit for a flat tire on lap 184. Under caution on lap 200, Harvick and Busch were two of the cars to take the wave-around to put them both one lap down. Following Logano and Elliott in Stage 2 were Larson, Almirola and Bowyer. Kurt Busch's victory locks him in the playoffs, though he was fourth in the points standing coming into the race. "It just matters to win," Busch said. "It's all about winning. I'm glad we did. We've been the most consistent team this year that hasn't won. I wasn't worried about not making the playoffs, so we could treat these races coming up as free-for-alls, and we're just gonna keep going after it."